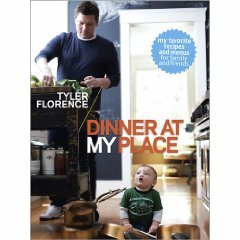 I chose Tyler Florence’s latest book as my very first review because he is one of my favorite TV personalities and I definitely respect him for his work. His recipes tend to be on the simpler side which is great, but also he packs in the flavor. Dinner at My Place, has some fantastic recipes in it, a few of which he has also shown on his “Tyler’s Ultimate” show. But the real thing I enjoyed about this book is the organization. He organizes the book not by ingredient, style, or even season, but by life moments and emotions. Apart from being a cookbook, it is almost a biography. Tyler spends a page or two at the beginning of each chapter explaining the situations that made the recipes in that chapter special. These are recipes that he has pulled from meals he cooked for special people in his life. Without knowing a bit about the setting, the recipes seem haphazard. Plus, he’s a funny dude and his stories are sincere. There was one particular chapter that had me laughing. His wife was about to go into labor and they were all sitting around nervously waiting. Suddenly Tolan, his wife, lets out a scream! Everyone there thinks that she has gone into labor! Instead, Tolan just witnessed some moron run into a fire hydrant outside their house, causing a flood. Hilarity ensued. And a baby happened. The recipes in the chapter are from the meal he served to the firemen who helped save his house from the impending flood. He makes smoked ribs with dry rub, spicy black-eyed pea relish, tomato chow-chow, and a killer bourbon peach cobbler. Tyler uses these small introductions in each chapter to talk a bit about food in America. There were two chapters that I thought were really timely. First, “Winner, Winner – Chicken Dinner (also my favorite Chapter Title). In just a single page, he breaks down the real differences between some of the common phrases that food producers are using these days to lure you to purchase their products: “All Natural”, “Free Range”, and “Certified Organic”. Second, I love his vegetarian chapter because it is exactly how I feel. I love meat. I was raised on the stuff and it will forever be a part of my diet. That said, I totally understand all of the reasons why people choose a vegetarian lifestyle and I want to respect that choice. That does not mean that when they come to dinner, they forage through side dishes. Tyler says it right, “I’m not about to alienate them and make them their own “special” meal. We’re all eating together and we’re going to share the same great food.” He spends a chapter walking through one of his vegetarian meals and it is fantastic. Heirloom, Meyer, and Dungeness Oh MY! The one criticism I have, which might be unavoidable if you are going to write a cookbook about the food you actually eat and you live in California, is that some of the ingredients are very exotic for people not living in California. For example, I feel a tad guilty sometimes buying a Meyer lemon because I know it has thousands of miles under its belt. And does my dish really need a Meyer lemon or would a standard old lemon work? Do I need that prized Heirloom tomato or will a beefsteak tomato do? Sometimes these “average” ingredients travel just as far as the exotic ingredients and it is just a matter of cost, but even then I would like a bit more guidance. Tyler doesn’t really distinguish and that makes it hard to learn when you actually do need the extra flavor that those ingredients can lend to a dish. On the exact flip side, a few chapters in the book lend themselves perfectly to everyday living. While I don’t have any children, I found one of his later chapters “Baby in the Kitchen” inspiring. He makes a good point that all of the baby food you buy in stores is over-processed and over-priced. There are ten recipes in the baby food chapter and if you have a new born, this chapter alone is worth the cost of the book. For the last chapter in the book, before the very thorough index, Tyler presents his “Cheat Sheet.” In this chapter you will find 22 very solid recipes for stuff you can use weekly. I have no doubt that I could make a recipe at least once a week based off of one of the things in this chapter and live a very happy life. Everything from “Pan Gravy” to a “Classic French Vinaigrette” to “Asian Stir-fry Sauce” is detailed in a quick, easy to reference, format. If I had to pick one recipe that I will definitely make from this book, and luckily I don’t have to pick one, I would pick this. It might not be the most original recipe or the easiest, but it just called out to me. A very classic Filet Mignon with a nice take on a béarnaise sauce. When I make this, not if, I’ll be sure to call your attention to the fact that I’m using Tyler’s recipe. I’m not at all surprised by how much I enjoyed this book, because I think I have a very similar take on food and cooking. While you might have to substitute a Meyer lemon for a regular lemon or an Heirloom tomato for a pint of cherry tomotoes, I think this would be a good addition to almost any kitchen shelf. Did you know? You can get Macheesmo posts delivered via email or RSS? It’s as simple as a simple vinaigrette. Great review–I'm definitely curious enough to want to go and check this book out! One thing that I don't think I'd like, though, is how the book is organized. Call me boring, but I like my cookbooks organized the plain, old-fashioned way: by food type (Appetizers, Soups, Meat, Poultry, Vegetables, etc.). Maybe it's because of the way I approach cooking, or maybe it's just because I'm generally a pretty ordered person, but I don't think I'd like a cookbook organized by something as ambiguous as one chef's life moments. That said, ultimately, I decide whether or not I like a cookbook based on its recipes. If the recipes are good, or I like the author, I don't care all that much about how it's organized. I have this Cat Cora cookbook that's organized by how long the recipes take to make. Love the recipes, hate how the book is organized. I'm curious: do you find the way the book is organized useful, or do you just like it for its creativity? Hi jessica. Thanks for the great comment. To answer your question, I don't find the organization in the book particularly useful but I like it because it touches on how much food plays a part in life moments. Also, it helps that there are maybe only 100 recipes in the book. It isn't a tome that needs strict organization. Your point is definitely a good one though. If "how to cook everything" was organized like this book it would be more or less useless.